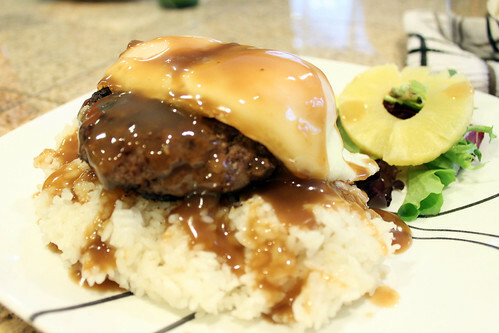 Loco Moco is one of my favorite Hawaiian dishes ever. The first time I tried a Loco Moco and fell in love was at Hukilau in San Jose. 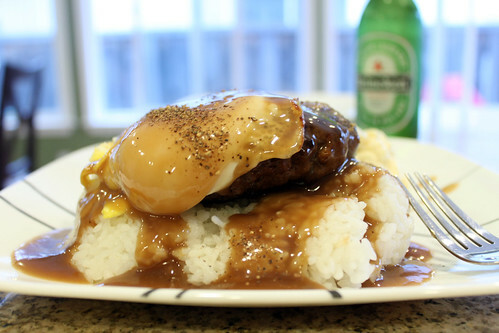 The hamburger patty was perfectly seasoned and juicy – topped with a sunny side up egg and smothered with gravy over rice. I especially like breaking the yoke and mixing the yoke and gravy in the rice. YUM! With the left over ground beef from the Burger Night with my family, I cooked up plates of Loco Moco for the boys while we watched the Los Angeles Lakers whoop on the Phoenix Suns. For this dish, I tried to make it as ‘authentic’ as possible. I went to the store and bought medium-grain rice, elbow macaroni salad, beef gravy, and pineapple for garnish. On my first attempt, I think the Loco Moco was a success and super easy to make. However, next time I make this dish, I might add a little more onion.